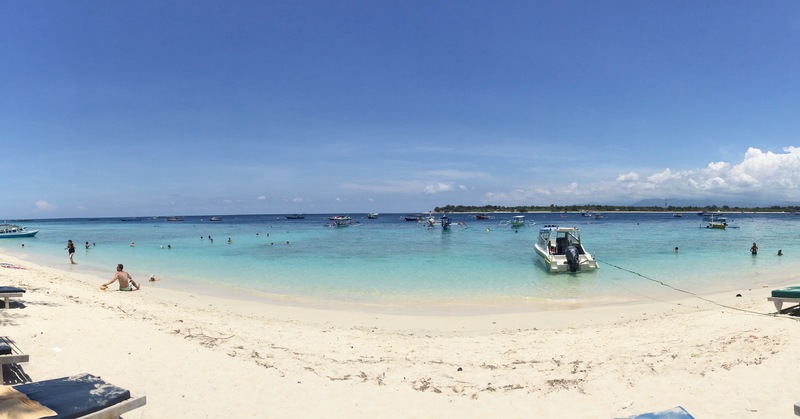 This is Gili Trawangan – doesn’t it look lush?! This is what we imagined when we thought of Bali. I hadn’t actually heard of the Gili Islands until we started planning what we were going to do in our two weeks in Bali. The first mention of these beautiful islands came from speaking to a lovely girl called Nancy in our hostel in Perth and then I read a little bit about them in my Lonely Planet ‘South East Asia on a Shoestring’ Guidebook. From that limited amount of information, we added it to our itinerary. And I am so glad we did. For those of you who don’t know (as I didn’t) the Gili Islands are a group of three small islands all very close together (you can see each island from the others) that are off the coast of Lombok – the neighbouring island to Bali. There is Gili Trawangan (Gili T), Gili Meno (Gili M) and Gili Air (Gili A). Gili Trawangan is the biggest with Gili Meno being the smallest and you can (and most people do) island hop from one to the other to the other. We had been told that Gili T was the party island with the most going on; that Gili Meno was a popular honeymoon destination with hardly anything going on; and that Gili A was somewhere in the middle. With this insight we decided, in the limited time we had, to not bother visiting Gili A and divide our time between the other two islands. On Gili T we stayed on a street off the main strip in a bamboo bungalow so that we would have quieter nights to get some sleep while still being a couple of minutes walk away from the beach, restaurants and bars. None of the islands are that big – I think they say it only takes a few hours to walk around the full thing – so, really, wherever you stay won’t be far from it all. The islands don’t have cars and the way to get around is to either walk (which we did), hire a bike and cycle or go by horse and cart – we didn’t do this because there was no need, we wanted to save money and we’re not really sure how well they’re treated so didn’t fancy it! We divided our time by spending a night on Gili T, a night on Gili M and then two more nights back on Gili T as this is where we have to get the ferry to get back to Bali (plus there is more to do!). Gili Meno is just like people say and has little to do – it is very peaceful and the beaches only have a couple of people on them so are very quiet. Unfortunately, when we were there (I don’t know if its always like this), the water was a bit rough compared to the calm waters of Gili T the day before so we didn’t see much when we went out snorkelling. We still enjoyed our time on the island and spent the rest of the day relaxing on the beach. It was very hot on Gili M and, naturally (if you know me you won’t be at all surprised by this), I burnt. In case anyone is wondering Niall didn’t (he also doesn’t get bitten by the mosquitos either so that’s another joy I get all to myself – but I digress). I think one night is enough on Gili Meno as Gili T still has lovely beaches but a bit more to keep you occupied, especially at night. A pull for many people to Gili Trawangan is its party scene. Apparently this is like Magaluf or Zante for Australians (unsurprising with how cheap it is to fly from Aus) and at night the chilled out vibe is replaced by lots of bars playing out heavy beats and everywhere offering happy hour drinks. On our first night we were drawn to one of the busiest bars which had a (very good) band playing songs from bands such as Foo Fighters, Guns and Roses and any other rock hit you can think of to a lot of people singing along. This was a complete contrast to our second night on Gili T where we were in a bar which was half a dance floor (the harlem shake even happened while we were there) and half a chill zone with bean bags on the beach. Our third bar was a lot more like a club at home (music wise) but was still outside on the beach with blue UV lights. This place was obviously very popular as it had 4 bars and was probably our favourite of our three bar choices. We tried a Joss Shot here which are really big on Gili T. You get a shot of some sort of spirit (I think vodka) and then add a sachet of ‘extra joss’ which I googled and is like an energy powder. The whole thing fizzes up and dissolves and you then drink the shot. It wasn’t bad at all! We really liked the places we visited on Gili T but unfortunately, due to us having to budget for a trip a lot longer than these two weeks in Bali, we didn’t have the money to stay out all night. Bali isn’t a cheap as we expected (or as other places I have been to in South East Asia) so we had to settle for soaking up what we could on a few bottles of beer. Another quirk to these lovely islands is that they all have a lot of cats on them. On Gili Meno I even saw a sign for some sort of ‘cat drive’ where they wanted volunteers to catch and look after cats so that they could get as many from the island neutered (they’re obviously a bit worried about an overrun of cats!) On two of our days on Gili T we had a beautiful ginger cat sit with us on the beach, letting us stroke it and also wanting our food (I duly obliged and fed it bits of our pizza). I have wondered how they first got onto these islands though – it does make a change to the number of stray dogs you get on the mainland mind! As I’m sure you can guess, the main things to do on the islands are to relax on the beach, swim in the sea and snorkel. We have brought snorkels with us on our trip which has been very handy as it means we don’t have to spend money hiring them out every day. The snorkelling is great (particularly on Gili T – that’s what we found anyway) and we went out a couple of times each day. A bonus to the amount of fish you can see is that the Gili Islands have turtles and we have been lucky enough to see one on two of the days we snorkelled! I love the amount of sea life here and so close to the shore as well. The water is really clear and we have even seen fish while just sitting in the shallow waters! I know that this post has been a lot more descriptive than actually filling you in on what we did but, really, that’s just because we haven’t done a lot. I even got a whole book read that I borrowed from where we were staying (I am not a fast reader!) but I guess that’s the point of these islands. Despite the burn (which will turn to tan so there’s a silver lining) I have thoroughly enjoyed experiencing these beautiful, chilled out islands and understand why people make sure to come here while in Bali.